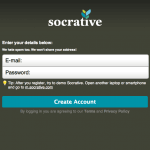 In this guide you will get an introduction to, how to use Socrative in education. 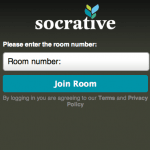 First, in order to use Socrative, you have to, create a profile on Socrative.com. Den oprettes let ved at klikke på ‘Sign up’ i øverste højre hjørne, and typing your e-mail-adress and a password of your own choice. Efter at have klikket ‘Create Account’ skal du indtaste dit navn, and give a few other informations. Then you'll get a brief introduction to the tool. When the introduction is completed, kan du klikke på ‘Start Socrative’ i en dialogboks. Then you will see the front page of Socrative. The most important thing here is the number, der står i øverste højre hjørne; dit ‘Room Number’. This number you should share with your students, when they are to respond to one of your test or one of your questions. 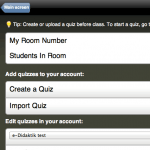 Students can answer your questions and test by visiting the website socrative.com og indtaste det ‘Room Number’ du har givet dem. They will then have your questions and quizzes displayed when you start them. They can also download an App for Android or iPhone/iPad. 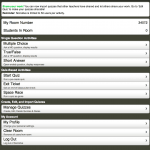 On the frontpage you have various options to create tests and questions. At the top you have the 'Single Question Activities'. The three options that are given here, can be used in connection with the oral questions from you, which you want the learners' written responses to. It is possible to ask multiple choice questions, where you ask the question and give three response options verbally, and the learners then select one of the three possible answers. There is also the opportunity of letting the students answer a true/false question, and finally, there is the opportunity to let your students respond to your question in open text-fields. Especially the last possibility is good for creating discussions on class. If you click one of these three options you will see a screen with the learners' answers to your questions. The students' answers will appear on the screen continuously, and you can display the incoming replies on the Board. Next, you have different options for running a quiz or test. You can run a test that you've authored, or you can run an 'Exit Ticket', which allows you, at the end of a lesson, to see if your students have learned what they should. You can also run a quiz/test as a game, where students are divided into two or more teams and compete against each other. At the top you give your quiz a name, and then you can enter your questions. You have both the opportunity to make multiple choice questions, with one or more correct answers, and to create open questions, to be answered with text. Når du er færdig klikker du på ‘Save’ nederst. Du får nu vist en dialogboks med et ‘SOC’ nummer. This number you can share with your colleagues, whereby they are given the opportunity to use your test in their own teaching. Du skal nu klikke på ‘Main Screen’ i øverste højre hjørne for at komme tilbage til forsiden og sætte din quiz i gang. On the front page click on 'Start Quiz'. På den følgende side får du mulighed for at vælge hvilken test du vil sætte i gang (rullepanelet øverst), and to start the test. It can either be started in a way, so please that you vælger hvornår eleverne skal have det næste spørgsmål (‘Teacher Paced Quiz’) eller så eleverne går frem i deres eget tempo (‘Student Paced Quiz’). 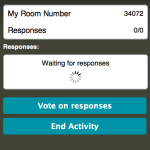 At the bottom you can select whether response options to the questions will be displayed in random order, and whether students should have immediate response to their answers or not. 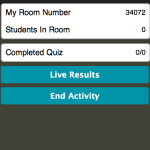 You start the quiz and can, som ved ‘Single Question Activities’ se elevernes indkomne svar løbende (klik på ‘Live Results’). Again, you can choose to show the answers on the Board. When everyone has answered, Click on ‘ Than Activity ’. 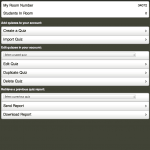 You will then be able to download a report of students' responses as a spreadsheet.